With all the talk of antenna TV and all the articles on this blog, I realized it had been years since I’d spent an entire day without a DVR. Maybe even as long as a decade, unless you count hotel room stays. So, last weekend, I decided to spend a day watching TV without a DVR… just depending on what was on live antenna TV. At first, I was struck by the additional clarity I saw with programs off the antenna. In the past, it didn’t seem like that much difference between satellite-delivered and antenna-delivered programs. Then I realized that the TV’s off-air picture settings were a little different from the satellite picture settings. I set them both so they were the same, but with a 46″ TV it was clear that there was just a little more pop, a little more sharpness from most channels. In some cases that wasn’t a good thing; I was able to see a lot more of the artifacts that come from HDTV compression, especially on live feeds from news programs. I got used to it, though. It was about 25 minutes and one large soda later that I began to feel a bit antsy. I began looking left and right, determined to make it to the next commercial break. Without a DVR I have to remember to plan better. Everything came out ok, as they say, so after that I limited my soda consumption a bit to take better advantage of my circumstances. I was fine for a while. 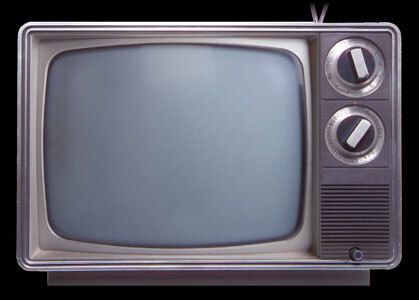 I actually enjoyed seeing commercials I hadn’t seen at first, but quickly realized that the same commercials repeat over and over and over and over and over… to the point where it really began to frustrate me. I kept nervously pushing the imaginary fast forward button, and of course nothing happened. By midday, I was getting used to the routine, and that’s when the phone started ringing, people started coming to the door and people in the house started talking. Even though I was, by then, engrossed only in an episode of Star Trek that I had seen about a kajillion times before, I found myself wishing for that pause button, paying a little extra attention to moments I knew woudn’t come again. Yes, live TV without a DVR is an experience with which I had become completely unfamiliar. Knowing that you can’t pause really makes you focus on the TV. I wasn’t inclined to touch my phone, not even once, and I found myself entranced with every moment whether important or not, treasuring it as if it were a sunset I would never again witness. This is how I remember watching television in my youth, I realized. This is how television was meant to be watched. I dare all of my blog readers to try it. It’s an eye opener. I happily returned to the land of the DVR, but I gained new respect for live TV, and for every fleeting moment that I could never replay. How can you tell a high-quality antenna?